Anyone who has a garden is making the most of it round about this time of the year. The flowers are in full bloom and the sunshine is glorious without being too hot. Eating outside is the perfect way to enjoy your garden, but choosing the right meal could be difficult. 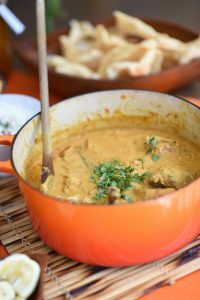 Curries make a great outdoor meal as you can simply bring everything outside and then have everyone help themselves. These are some of Pippa Mattei’s favourite curry recipes. Fry chopped onion in ghee or vegetable fat till transparent. Add chicken pieces and fry till golden – remove and set aside. Add all spices to the hot fat and fry till all change colour. Add chopped apples, garlic and tomato pulp, stir in, then add all other ingredients except yoghurt and coconut milk. Put back chicken pieces, cook till chicken is coated in the sauce. Add the coconut milk, cover and cook gently till chicken is tender (approx. 50 mins). Leave overnight then heat again, add yoghurt and garnish with fresh chopped coriander. 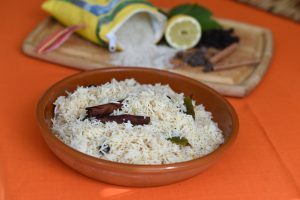 Serve with basmati rice and a selection of accompaniments. Rinse the rice well and drain. In a large casserole melt two-thirds of the butter and sauté the onion for about 5 minutes. Add the rice, stir well, then add the herbs, whole spices and lemon zest and cook for one min. Pour in the boiling stock or water and mix into the rice, along with sea salt and ground black pepper to taste. Cover and bake in the oven for 25 mins. Leave to stand for 5 mins, then remove the lid and fork through the remaining butter until the rice is fluffy and separated.